Wonderful amazing Family bred Quality West German pups. AKC registered with microchip, insurance, leash, collar, book, training videos, veterinarian wellness report and much more. Obedience and Health titled wonderful parents that you can meet in person. Items Included: Treasure & Shockwave Family 5 Generations Family Tree in full color, titles, health documentation all included. Insurance introductory policy, microchip, Animal Recovery 24/7 for life, AKC reg NB, leash, collar, vitamins, health supplement, Instructional Training & Video Library on flash drive, Lifetime Support & Instructions. Dad is our BFF Family dog. Shockwave has 7x V1 1x VA International/National/Honors Champion, Rally Obedience Highest title, Trick Dog Highest Title, Obedience Titles, Canine Good Citizen, Community Canine, Urban Dog Certified, farm Dog Certified, OFA certified hips, elbows, heart, eyes, DM-NN, DNA and much more. The sweetest big big big GSD 127 lbs of wonderful . Great with kids, cat, little dogs, family, friends, neighbors, everyone except the bad guys. Treasure is her name. Our lovely sweet loving family girl. Like the Daddy Shockwave and Treasure have straight strong backs, walk on their feet, love with their hearts, are medically sound and have lots of AKC Obedience titles and Health Titles to prove how wonderful they are. 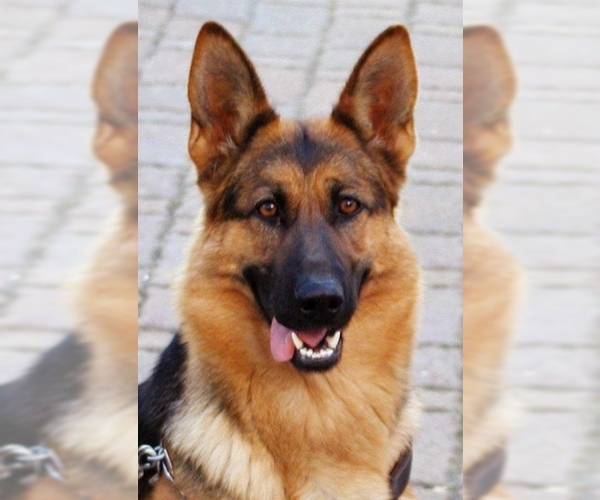 Overview: The German Shepherd is unmatched in character and courage. These dogs make great companions because they are loyal and have the heightened senses of an excellent watch dog. At the same time, they can be gentle and playful companions for children. Colors: Most colors, other than white, are permissible. Coat: Dense, straight or slightly wavy, harsh, close lying of medium length. 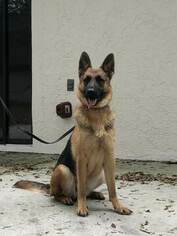 Character: German Shepherds are very intelligent, loyal, and obedient. These dogs are known for their bravery and protective nature. Temperament: This breed is very territorial, making them among the least likely of breeds to run away. They are also excellent watch dogs. This breed gets along fine with children and other animals, as long as proper socialization has taken place. Care: The German Shepherd requires grooming with a special comb to remove dead hairs. Training: This breed is a well-known eager pupil. They respond well to your voice, so training can be quick and impressive. Activity: German Shepherds need to keep busy, so they are very well suited to some type of work and a good amount of exercise. Health Issue: This breed is prone to hereditary disease, such as hip and elbow dysplasia, blood disorders, digestive problems, epilepsy, chronic eczema, and keratitis. She has shot records, deworm record, AKC Registered paperwork. Can provide carrier for extra, can deliver for extra or you can pick her up here. Full of cuteness. AKC REGISTERED; Beautiful Red and Black, Black and Tan GSP. Dew claws removed, vetted, and ready to go. Born February 4th. Great blood line. 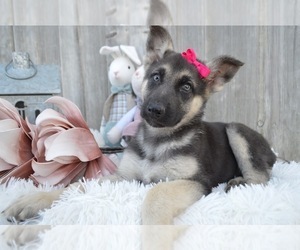 AKC Registered German Shepherd puppies, shot records, deworm record, can provide carrier for extra, can deliver for extra or you can pick her up here. White collar. 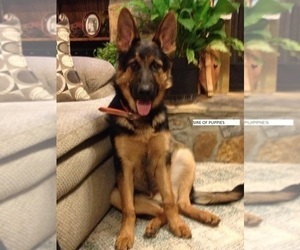 AKC Registered German Shepherd puppy, shot records, deworm record, can provide a carrier for extra, can deliver for extra or you can pick her up here. Full of cuteness and fun.